Are you tired of taking your scuba tanks to your local dive shop for air fills? 1. Plug in the device to any USB port on your computer. 2. Connect the high pressure hose to your scuba tank (DIN and Yoke valves are supported). 3. 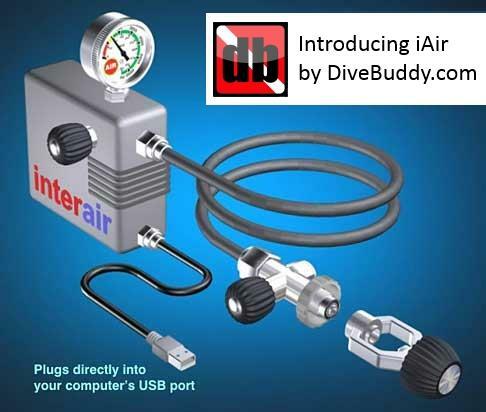 Open a web browser and go to DiveBuddy.com to pay for your air. The iAir device is free of charge! You only pay 10 cents per 100 PSI. For example, if you already have 300 PSI in your scuba tank, and you fill it to 3000 PSI...you only pay for 2700 PSI or $2.70 for your air fill! Click here to have your iAir device shipped today. If you want to dive without a tank, check out the new hoseless and tankless regulator by Mares. Any way to hook it up to a hooka? I can just hook my laptop to my cell for WiFi and float them on a dive flag bouy. I would only pay for what I use...I guess the software may need to be able to keep a log just in case I loose cell service for some reason. Wouldn’t want to be down a the air stop. Does it come with a iPad or iPhone adaptor ?? Could down load some fresh air, from the iclouds :) Good one Greg !! Once word gets out about this new portable home/car air-fill station, all of the sandbaggers in diving will put the dive shops out of business! Then the rest of us will be forced to get one. I never thought the dive industry would go down the tubes so quickly. What a pipe dream; there;s an Einstein born every minute! Does it have it’s own anti virus? Do you accept Paypal. I am thinking of putting one in my car for field trips or will my car usb charger not work. Hilarious. Great Greg. Belated Happy Birthday. Works with Apple (in Indiana)! That is awesome..."Coming Soon — The EtherFill 5000 Plus will enable you to upload your leftover fills to your own private storage bank in ’Microsoft Cloud’. You will be able to use your stored gas yourself at a later date, share it with your buddy, or trade it with other EtherFill 5000 Plus owners." I saw an Ebay listing for pills that if you took one you’d grow gills and you could breathe UW. Do you think they are lying? lol I almost fell for it, but that would be a freaking awesome invention. Funny April Fools Joke but it sure would be nice !!! Happy Birthday Greg, or is that a prank too? No, that part is real :) Thank you! Scuba c-card and getting air fills. Oxygen tank or compressed air tank?